UNITED NATIONS, February 21 -- An employee of UN University, Ramon Ray, on February 13 charged $99 attendance fees to his "Technology Evangelist" workshop held cross-town at the Crowne Plaza hotel in Times Square. Such moonlighting, particularly during daylight hours, is contrary to UN rules and directives, unless it is explicitly approved by the Secretary-General. One week ago, Inner City Press asked Secretary-General Ban Ki-moon's spokesperson's office to simply confirm or deny that Ramon Ray has permission for outside employment. After two days, Inner City Press repeated the question at the spokesperson's noon briefing. The question was reassigned to another staffer, who projected a definitive answer before the weekend, and then by the end of February 20. No answer has been received. "Ramon Ray, Administrative Officer, is responsible for the overall financial, personnel and administrative functions of the office. Working closely with UNU Headquarters in Tokyo and and [sic] UNU Center's around the world, he ensures the smooth flow of information between UNU System and UN Headquarters in New York." While doing this work, Mr. Ray has managed to organize the $99 seminars, to respond to attendees' requests to attend, to speak at the seminars and to thank participants afterwards. Perhaps it's that there isn't much "close work with UNU Headquarters in Tokyo" to be done. To save money, UN University is moving jobs away from its headquarters in Japan, to Kuala Lumpur in Malaysia. 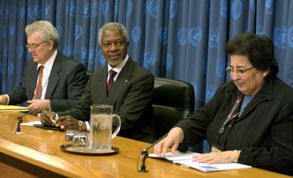 Simultaneously, Malaysia committed in May 2006 to provide UNU funding for another regional center. This time of arrangement is at least more out-in-the-open that the arrangement made to lure the UN Office of Project Services to Copenhagen, click here for that story. This is how it works at many of the UN's satellite affiliates: each is engaged in its own fundraising. As first reported by Inner City Press, the UN "mandated" University for Peace, based in Costa Rica but paying Nay Htun to run a New York office out of UNOPS, drummed up money by providing a non-audited way to pay for the travel of 10 North Korean officials to Sweden, click here for that story. UNDP country offices routinely rent out the UN's powers to governments and private corporations, under UNDP's "cost-sharing" model. And UN DESA takes money from member states to employ those states own nationals, as reported regarding Italy and soon another country. "not much is known of the actual operations of UNU... 'UNU is said to have fallen into a difficult financial position The Rector goes out on overseas missions every month and, in bad months, he is in Japan for only 3 days. Other foreign employees at the management level also often go on missions. The current 4th Rector (since 1997) is a Dutch[man] named Hans Van Ginkel. The Rector�s annual salary is US$120,000, and including other allowances, he should be receiving no less than $150,000. Professional employees receive about $1million yen per month. If they go on a mission, they receive per deim according to the country they visit. For example if they are going to New York or Washington, it would be more than US$200 per day. It certainly amounts to a good sum if you are away for half the month. Housing allowance is also paid and 80% is reimbursed... There was also a time when internal corruption of UNU was made public also. In the same year as the audit, the UN Financial Auditing Committee reported in its audit report that there were 2 cases of hiring consultants where the procedures were not correctly adhered to. One was that a consultant was paid US$25,000 in advance but no report was made of this for 6 years... There are times when Human Resources puts out an advertisement for a position, but that tends to just be procedure, and in reality the candidate is usually already decided on.'" This critique is one that is echoed at UN Headquarters in New York. A Yomiuri Daily op-ed in August 2006 posited that while UNU's "headquarters building in Tokyo's Aoyama district certainly looks inspiring, what happens inside is much less impressive... It is clear that governance of the UNU is problematic. The [UNU C]ouncil is doing a poor job overseeing the work of the University." Nor, apparently, is it overseeing the outside work of UNU's own staff members. Again, more than a week has elapsed since Inner City Press asked the UN to confirm or deny that UNU's Ramon Ray has the Secretary-General's approval for this outside work. While no answer has been provided, one excuse offered for the delay is that the UN's Office of Human Resources Management, run by Jan Beagle, does not like to comment on personnel matters. But on this question whether a staff member's outside work is permitted, arguably a list of those permitted should be available online, or at least upon request, and faster than in one week. Because a number of Inner City Press' UNU sources go out of their way to express commitment to scholarship and in some cases to serving the poor, and while it should be unnecessary, Inner City Press is compelled to conclude this installment in what will be an ongoing series by saluting the stated goals of UNU and many of its staff and programs. Keep those cards, letters and emails coming, and phone calls too, we apologize for any phone tag, but please continue trying, and keep the information flowing. UNITED NATIONS, January 31 -- Even before the UN Development Program scandal fully broke on January 19, Ban Ki-moon had said that the UN in 2007 would exhibit a new transparency, a new trustworthiness. One of the most apparently resistant UN agencies is the UN Population Fund, UNFPA. For the past ten days, Inner City Press has awaited answers from UNFPA about its programs in North Korea. While other funds such as the UN Children's Fund and even more attenuated specialized agencies such as the Food and Agriculture Organization have responded to exactly the same questions, UNFPA has refused to provide a single answer. In the interim, sources have provided Inner City Press with a copy of the most recent internal audit report of UNFPA's County Office in DPR Korea, dated May 2006. This internal audit was carried out by KPMG in-country from May 23 to May 29 and is 68 pages in length. Even while failing to criticize UNFPA's provision of hard currency to the Kim Jong Il government -- perhaps because all of UNFPA's payments were and are through UNDP, which has been criticized by its Executive Board for this -- the audit paints a disturbing picture of UNFPA. At UNFPA in North Korea there is slopping bookkeeping, at least, for payments of $96,000 and $93,000 and $77,000. KPMG diplomatically notes an "absence of documentation for independent verification." There was a murky "transfer of assets" worth $420,000 to the North Korean government. A consultant was hired to pen some praise of UNFPA's and the DPRK's "partnership," but was paid before the work was done, and the work was never evaluated. In a project from the European Commission, KPMG notes "unauthorized use of project resources," without saying by whom. Inner City Press has previously obtained and reported on UNFPA internal audits from Pakistan -- where the country officer who received a rating of Deficient, Olivier Brasseur, was then elevated to head all of UNFPA's audits -- and Nigeria and Congo. Click here for that coverage. Ten days ago, Inner City Press asked UNFPA for comment on these issues. Spokesman Abubakar Dungus on January 22 said he would respond that day. He did not, and two days later he sent out a message that he was out of the office., This despite numerous other spokespeople informing Inner City Press that not only was and is Mr. Dungus inside UN Headquarters, he is conferring with them about responding or not responding to Inner City Press' questions. The prevarication apparently continues, because in ten days, and despite a reminder on the morning of January 31, there has been no response at all. On January 26, Mr. Dungus' boss Safiye Cagar, previously seen knitting or crocheting in the January 25 Executive Board meeting, told Inner City Press that Mr. Dungus was on retreat. Minutes later, UNFPA security chief Janie McCusker attempted to have Inner City Press' correspondent barred from the Executive Board meeting. When this failed, Ms. McCusker was seen whispering with Ms. Cagar, Kwabena Osei-Danquah and UNFPA Executive Director Thoraya Obaid. The three had previously been discussing, with some distain, the call for the release of internal audits of such issues as lack of independence in hiring, payment of hard currency, and lack of oversight of nationally-executive programs. Ban Ki-moon has called for an audit of just such issues. While he remains traveling, questions about the timing and the scope of the audits are going unanswered. But given the contents of UNFPA's internal audit, and given UNFPA's unique approach to press relations, UNFPA would seem ripe for external audit, right behind UNDP. UNDP's limited disclosure of the size of payments in North Korea is another issue to be addressed. But for now, here below are findings from UNFPA's May 2006 internal audit. In the "Management comments" that follow, UNFPA claims that it "is doing good comparing with other UN agencies resident in DPRK." The auditor KPMG -- also the auditor of UNDP in North Korea -- does not reply. Then again, since UNFPA refuses to show these audits even to the member states on its Executive Board, perhaps there's no reason for KPMG to reply, or to even in this audit reach a conclusion on the payment of hard currency to the Kim Jong Il government. -a final evaluation of the consultant�s work was not prepared to certify satisfactory completion work prior to release of final payment. - Validity of contract could not be ascertained. -Release of final payment prior to satisfactory completion of work." This sounds not unlike the consulting contracts at UN DESA's DPADM under Guido Bertucci, the status of whose audit by OIOS remains unclear, as raised at the Office of the Spokesperson for the Secretary General's noon briefing on January 30, click here for video. When UNDP proclaimed low figures as volumes of payments in North Korea, it omitted any mention of money it pays for other UN agencies. A full accounting is being sought. "We noted that one PO CHN40-000262 raised by UNFPA China amounting to US$96,020 did not specify the details of the medical supplies procured. The narration recorded in the PO was only a one line narration of 'Pharmaceutical Products' referring to the Invitation to Bid (ITB) No. 04BJDRKDM. In addition, we also noted that the procurement file maintained in the Office is not always updated with the hardcopies of the PO raised by UNFPA China and email correspondences between the Office and UNFPA China. For example, a copy of PO for the procurement of pharmaceuticals products amounting to US$ 93,327 was not available in the procurement file and the Office kept the draft version (unauthorized) of the PO CHN40-000397 amounting to US$77,726 in their procurement file. Supplier may supply wrong product --Absence of documentation for independent verification." "An invitation to bid was conducted by UNFPA China for the Office to procure Medical Equipment and Beijing Renfa RH Company ('Beijing Renfa') had quoted the lowest price of US$59,339. The opening of bid was performed by UNFPA China on 10 May 2005. We noted the following issues relating to this bidding: Subsequent to the bidding process, Beijing Renfa sent a letter to UNFPA China on 22 June 2005 that they had wrongly quoted the price in their original bidding document, due to their mistake of not adding the video printer cost in the Ultra Sound Scanner price resulting in additional amount of US$6,760 of the total price; The total worth of goods delivered by Beijing Renfa was increased from US$59,339 (as per the invitation to bid document on 11 May 2005) to US$ 99,326 (as per the supplier�s invoice on 5 August 2005 due to additional request for procurement from the Office. The Office did not maintain records to evidence competitive bidding for the additional procurement and the final delivery reconciled to the request for procurement; The freight charges in the supplier�s invoice was US$1,700, which was higher than UNFPA�s PO by US$500; and The invoice for this procurement was from Beijing Marine Shipping Company for US$99,326, and not from Beijing Renfa. The documents were only provided to us after requesting the Head of Office to contact UNFPA China. Unauthorized payment. Inaccurate reporting of assets. Erroneous profiling of assets. Assets worth US$420,293 from the previous Country Program transferred to the Government on 9 November 2005 was still registered in the AMM�s as of 31 December 2005, and the assignment of profile IDs for some of the Assets in AMM did not reflect the nature of the asset. The common services agreement for 2005 has yet to be finalized and agreed with UNDP as of May 2006 There was no matching exercise conducted for the implementation of the Office which was classified under typology type II as per the circular from the Chief of Human Resources on 7 March 2003. Due to the operating constraints within the country where the national staff were selected and seconded to UNFPA from the Government and competitive selection was not a viable option. The Office had written to the Director of the Asia Pacific Division ('APD') informing him that the compliance to the Office typology could not be met during his visit to the Office in 2003 as noted in the Country Office Annual Report 2003. On 6 February 2006, a follow-up meeting was conducted between the Director of APD, Country Director and Head of Office to discuss this issue. However, there has yet to be a formal response from HQs that the Office was exempted from complying with the Office typology. As a result, the compliance of the Office typology particularly on competitive recruitment, succession planning and continuous education program could not be met since the Government would have the right to appoint or recall the seconded national staff. " -After receiving the remaining 20% of ECHO funds, the Office and HQs had tried to reconcile the actual expenditure and the budgeted amount. However, there was still a remaining balance of US$23,065 recorded for DRK03P01 in the budget status report for 2005. There should not be any remaining balance since the budgeted amount has been fully utilized... Inaccurate information of remaining fund. Incomplete information of accounting record Unauthorized use of project resources." "The budget allocated for WHO execution was US$193,500 for 2005. However, in the AWP, an amount of US$47,000 was manually recorded as balance carried forward from 2004 in addition to the allocation in 2005. The amount was inconsistent with WHO financial report claiming that the amount carried forward from UNFPA from 2004 was US$62,452; Our review of the financial report submitted by WHO revealed that an amount of US$156,388 out of total budget of US$255,952 was still in �unliquidated/earmarking� column indicating that the plan activities (mainly fellowships) for the year have not taken place. As at our audit date, the Office was not able to confirm whether WHO has successfully completed the outstanding activities as at 31 December 2005. The information on the utilization of the unliquidated amount was only provided to the Office after being requested the audit team. Ineffective monitoring of resources. Error in financial reporting."